How long have you been struggling with your weight? For how long have you been too scared to step on the scale? For how long have you felt ashamed because of the way you look? Well, your troubles have come to an end. Say hello to Chocolate Slim – the most efficient weight loss product out there. 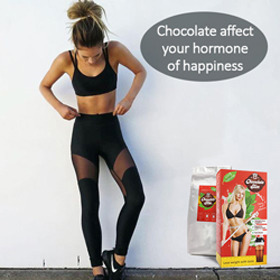 What makes Chocolate Slim so effective? Chocolate Slim contains only natural, eco-friendly products, with no conservants added. Also, you will find no taste enhancers or GMO products in it. Furthermore, there are no artificial ingredients like dyes, parabens or synthetic aromas. This product is completely safe, and you can use it every day. But what makes it so great fighting extra pounds? Well, it contains healthy ingredients like fiber, soy lecithin, whey protein, and cocoa. Finally, Chocolate Slim contains a mineral and vitamin complex. With this product, you will see results before you can believe it. Projected weight loss can climb to 24 pounds in only four weeks if you keep the discipline level high. For best results, add in moderate exercise and a healthy food plan. The 24-pound mark is then practically guaranteed. Drizzled with magical avocado oil, I cant get enough of this fresh veggie noodle dish. In a pot of boiling water, cook kamut udon noodles as per package instructions until al dente, usually 8 minutes. Drain and rinse with cold water. Pour noodles back into pot with heat on low to medium. Then add kale, carrots, tomatoes, mushrooms, tamari, honey, red pepper flakes and avocado oil. Heat gently, stir until steaming and kale has softened, 2-3 minutes. Garnish with thick slices of avocado and squeeze of lime juice. Dig in! Avocado oil! Wow, sounds delightfully decadent. I love how avocados are your signature ingredient. I am trying this one pronto! Yesterday I ate an entire avocado seriously, just cut it open, cubed it and picked at it with a fork. I was planning on putting it on my salad, but somehow it never made it. ROFL. This looks so good! Very similar to what I had for dinner, but I think Ill try this recipe to the letter soon because it looks so yummy! Oh Jennifer this looks amazing! I have a bottle of avocado oil in my pantry that I have yet to try using! I need to buy some noodles ASAP! Thanks for the recipe. It sounds so delicious, I will have to try it soonHave a wonderful weekend, Jennifer! Melissa Awesome! That makes me happy to hear that!